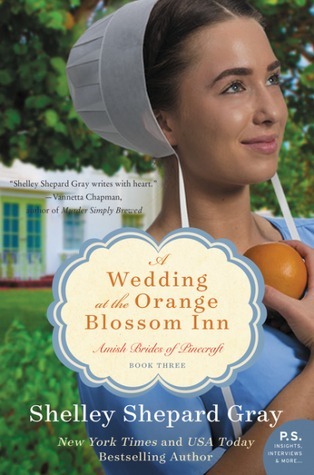 Today I am reviewing A Wedding at the Orange Blossom Inn, the third book in the Amish Brides of Pinecraft series by Shelley Shepard Gray. In the third book in New York Times bestselling author Shelley Shepard Gray’s Amish Brides of Pinecraft series, a wedding brings together two young widowed parents . . . and gives them a second chance at love. I really, really want to move to Pinecraft, Florida! As a matter of fact, after reading this series, we are planning a trip to Pinecraft this year! Pinecraft is noted for it’s Amish and Mennonite population — and I’m not Amish or Mennonite — but I really think I’d love living there among the plain people. My family has been adapting our lifestyle for several years, letting go of bits and pieces, hoping to adapt to a plainer life. The characters in this sequel are delightful! Emma Keim and Jay Hilty have both lost their spouses; they both have three children –- Emma has three daughters and Jay has three sons -– and to marry would make life easier for everyone involved. Unfortunately, in a strange turn of events, Emma’s parents -– and in-laws –- all want Emma to stay single –- to honor her husband’s memory. Or is there another reason? You’ll love this story… Shelley Shepard Gray writes awesome Amish romances! Need To Write More Books About Pine Craft As I’ve Read Them All. Have Visited There Many Times As I Had Lived About 1 1/2 Hours Away. Loved The Big Vegetable Market & Yoders Rest. I’m actually planning a trip there this year. It’ll be my first time visiting Pinecraft. Next year Naomi Miller is writing a book about Pinecraft!